From February 26th to April 27th, 2016, Galerie m will be showing the work Fuga by the Brazilian artist Carla Guagliardi (b. 1956 in Rio de Janeiro), who splits her time between Berlin and Rio de Janeiro. 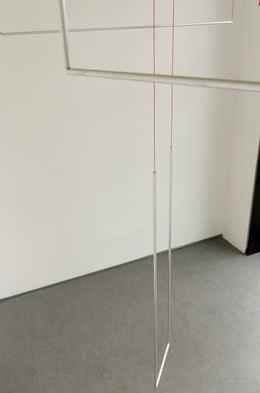 The installation of aluminum tubes along with a thin elastic cord takes up the entire small exhibition space. The construction seems to float with weightless ease – and in fact the metal tubes are suspended in the air in a finely calibrated balance. The elements are all frozen into position, restricted by the walls all around and the red cords that hold them. 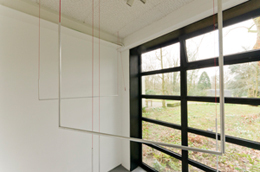 The lines of the installation slice through the empty space from one point to another, redefining it in the process. Like many of the artist’s works, this installation was developed specifically for the space in which it is displayed. It has neither a precisely defined size nor a fixed center. Carla Guagliardi uses mostly untreated, often industrial materials in her work. The elements here are commercially available tubes that have been divested of their practical function. The artist is skilled at bringing out the simple aesthetic of the material to best effect. The coarseness of the aluminum tubes contrasts with the softer look of the cords made of synthetic red fiber. Due to the weight and inflexibility of the tubes connected by the cord, the installation is under tension. When contemplating the structure, this tension becomes palpable, generated as well by the interplay between the two different materials, which activates the space and the air between them to make them a part of the work.